As the host of 3ow Powhz! 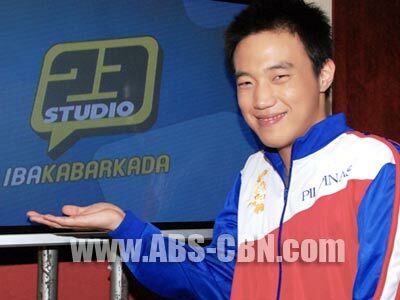 one of Studio 23’s newest shows, Ryan Bang is especially excited at the chance to further entertain his growing number of Filipino fans. “I really like doing just comedy, making people happy. Just like the comedy I do in Showtime everyday. I like meeting people, good energy, saying hello everyone and making people happy,” he says. But the former Pinoy Big Brother teen housemate says that before he entered the spotlight, he was not always the optimist. “Now I’m a really happy person. I always smile. Unlike before in Korea, I was not really happy, I was sad. I don’t know, but I was not a happy person. I’m from Seoul. I came here and I change,” he says. Ryan has been residing in the Philippines for five years now and is a Business Management student at the De La Salle University. But even with his extended stay in the country, he admits he still finds it hard to understand and speak the local language. “Kasi I’m not really smart. I really want to speak Tagalog, but it’s very traffic. My brain is not really working. But I really want to learn. Inside the house, I try to learn Tagalog words,” he shares. One of his dream projects is to get the chance to work with champion boxer Manny Pacquiao. “Yung comedy lang. Maybe do a comedy movie or show. I want to meet him! Because he’s very strong. I like it,” he says. An avid soccer player, Ryan admits that he has grown to love Pinoy food like fish balls and pancit canton. “It taste good. I like very much!” he says. Being a friendly person, it’s not surprising that he has grown to become close with other celebrities like Melai Cantiveros, Jason Francisco, Yeng Constantino, and his Showtime family. “Ate Yeng is very nice. I go to Victory church with her at the fort. I like everyone. My Showtime family is happy. Ate Vice Ganda, she’s very kind. She’s very funny and Ate Anne Curtis, she’s also very kind. Kuya Vhong (Navarro) is very funny,” he shares. Out of all the pretty Kapamilya talents, Ryan says he is attracted most to Maja Salvador. “I like Maja. Because she is really pretty. But I have many crushes. Everyday I change my crushes,” he adds. The 3ow Powhz! host also shares what first brought him to the country. “The first time, my mom sent me here for a few months was to study English. But after that, she said come back first to Korea. I wanted to stay here more. Because for three months I already made good friends so I want to stay here so I asked my mom for me to stay here. So until now, I stay here,” he explains. Even though he is enjoying his time working and studying here, Ryan says he still can’t help but miss his parents who are based in Seoul. “I miss Korea because my parents are there. I’ve lived alone here in the Philippines without my parents for five years. I stay with my mom’s friend. So my parents are not with me. But it’s okay. When my mom see my report card, she punch me. But it’s fine,” he says.